ELIXIR > Promotions > £70 of Leighton Denny beauty products to be won – comp now closed! £70 of Leighton Denny beauty products to be won – comp now closed! Leighton Denny MBE is a leading expert and an internationally recognised figure in the beauty world with a multi-award winning range of nail and tanning products. With a vast amount of significant achievements, he also possesses a star-studded client list that includes Kate Moss, Penelope Cruz and Adele. Leighton began his journey as a forklift truck driver in Bradford, but quickly progressed to becoming one of the UK’s leading nail and beauty experts. 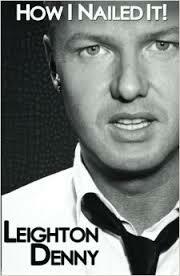 Whilst he was building his empire of over 1000 appointed salons worldwide, Leighton won over 60 industry awards. He produced his own lines of nail and beauty treatments, which quickly became cult favourites amongst beauty professionals and customers alike. In April 2012, Denny introduced Lip Dual to his ever expanding beauty portfolio. This 2-in-1 colour system offers full lip colour with built-in ultra-conditioning moisturisers for colour intensity that lasts for hours. Read more about himand his unique products at www.leightondenny.com. We have three of his signature products for you to win – worth around £70 and also a copy of his book – How I Nailed It! – which tells his inspirational story. All you have to do is answer a simple question at the end of this article. FACE Hydrating Facial Self Tanning Cream With YOUTH GLOW TECHNOLOGY® – costs £35 for 50ml – colour medium. Your skin will be immediately sun-kissed thanks to the in-built caramel hue, whilst 100% naturally derived and EcoCert tanning ingredients adjust to your natural skin tones for a healthy looking tan that will develop fully in just 4 hours. REPLENISH your skin with Jojoba Oil that provides a non-tacky, non-oily and non-greasy softening effect to the skin.RESTORE your youthful glow with Hyaluronic Acid utilised as a filler agent to help improve the apperance of wrinkles and aides in increasing hydration. REVIVE the appearance of tired-looking skin thanks to the moisturising properties of the Virgin Plum Oil and the anti-inflammatory, anti-ageing effects of Organic Black Seed Oil. The 2-in-1 lip colour system, features an extreme-wear lip stain and ultra-conditioning lipstick which combined, deliver unbeatable colour-staying power which will not feather or fade and requires no touch-ups. Lips will feel kissably soft and colour perfect. Kiss Goodbye to Lack-Lustre Lip Colour With Lip Dual. Lipstick – the rich and creamy Lipstick provides a luxurious colour to your lips. Rich in anti-oxidants and ceramide-like ingredients the lips are protected against dehydration keeping them soft & supple. A blend of special waxes prevent the colour from melting & bleeding. OUR WINNER IS Mrs Joy Kehoe, from Pontypool, Gwent. This entry was posted in Promotions and tagged competititon, Leighton Denny, lipstick, nail varnish, varnish by admin. Bookmark the permalink. Ty A, they were lovely! Wow impressed with inspirational story and he’s so handsome !!! !